The Solution below shows the F-flat phrygian mode notes on the piano, treble clef and bass clef. This step shows the ascending F-flat phrygian mode on the piano, treble clef and bass clef. It also shows the scale degree chart for all 8 notes. The F-flat phrygian mode has 5 double-flats, 2 flats. This step shows the descending F-flat phrygian mode on the piano, treble clef and bass clef. This step shows an octave of notes in the F-flat phrygian mode to identify the start and end notes of the mode. The F-flat phrygian mode starts on note F-flat. 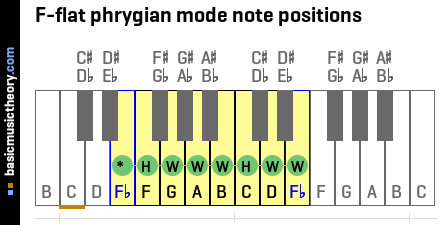 This step applies the F-flat phrygian mode note positions to so that the correct piano keys and note pitches can be identified. 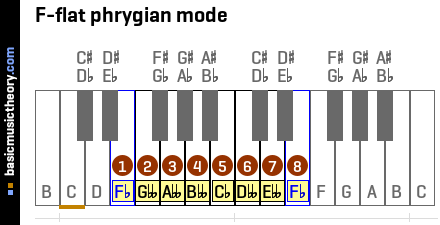 The F-flat phrygian mode re-uses this mode counting pattern, but starts from note Fb instead. For this mode, there are 6 mismatches (Shown as m in the Match? column), whose note names will need to be adjusted in the next step. 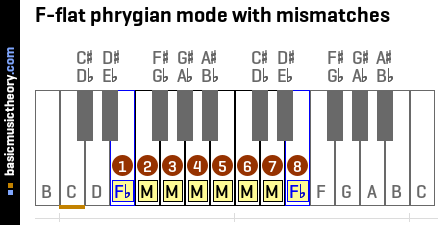 The match fails when trying to find a G -type of mode note, because either this type of note does not exist in this mode, or it exists but is in the wrong position number / table row for this match. But music theory rules allow the name of any note to be sharpened or flattened, even white note names, so since a G-type of note name is needed, the real mode note F will be renamed to Gbb. Of course, even though the note is named Gbb, when it comes to playing the note on an instrument, the real note F is really played. This step shows the notes when descending the F-flat phrygian mode, going from the highest note sound back to the starting note.